It’s time to reduce your carbon footprint and a great way to begin the process is to re-insulate your home. You’ve been told that it’s a simple process of adding new spray polyurethane foam insulation in the attic. You’ve been told that you can save up to 20% on your next energy bill. You’ve also been told that you’re currently losing as much as 40% of your homes energy efficiency due to air infiltration. Spray foam offers a solution: it performs as both insulation and an air sealant, or air barrier, closing those nooks and crannies that let air escape and add dollars to monthly energy bills. You’ve double checked what your SPF salesman has told you about the energy savings and found that the U.S. Environmental Protection Agency’s (EPA) Energy Star program estimates that by adding insulation and sealing air leaks you can save up to 20% on your monthly energy bills. You’ve also found that the U.S. Department of Energy estimates that 56% of the energy used in a home goes to heating and cooling. Your home’s heating, ventilating, and air conditioning (HVAC) system has a big effect on your utility bills and your energy consumption because it has to work hard to keep up with all that air leakage. You’ve done your homework and you’ve decided to move forward with your purchase and application of spray polyurethane foam insulation in your home’s attic. You’re excited about increasing your “R” value and saving those energy bucks but still just a bit concerned about all those potential indoor air quality IAQ issues that you have been reading about while researching the energy savings of SPF. Spray foam insulation can help reduce the workload on your HVAC system thanks to its high R-value and effectiveness. In fact, with spray foam, HVAC sizing can be reduced as much as 35% without the loss of efficiency and comfort. With some luck you’ve read my previous articles and have asked some very critical questions prior to your decision. Remember, there are differences between spray polyurethane foam insulation and blown or batt insulation that go well beyond the R value and energy savings. All insulation products aren’t created equally and some insulation products provide much more than just R Value. When you install spray polyurethane foam SPF insulation, you change the way your home performs. You’re reducing your homes air leakage or air infiltration. Great stuff right? Well, yes and no. Yes for energy efficiency - less is more analogy is a good thing; however, when it comes to your indoor air quality, IAQ, less is definitely not more and absolutely not better. Your home’s air leakage or air infiltration rate is the source of the home’s air change rate ACH. When you seal up your home you may also be substantially reducing your home’s ACH. When you insulate with SPF you’re not just improving your home’s R-value, you’re changing the way your home achieves the ACH necessary to maintain good indoor air quality. Today, we have very specific guidance documents that help both the consumer and the applicator better understand the difference between a traditionally ventilated attic and a SPF unvented attic. Guidance on Best Practices for the Installation of Spray Polyurethane Foam established by the Spray Foam Coalition of the American Chemistry Council, ACC, Center for the Polyurethanes Industry states that the contractor and the homeowner should be aware that retrofitting an existing attic by employing an unvented attic assembly technique can result in the existing HVAC system becoming “oversized” in relation to the new demand. This situation is of special concern in the southern and coastal climate zones where the HVAC also serves to reduce or otherwise manage moisture levels of buildings in order to improve comfort and prevent moisture related problems, such as mold and mildew. If an existing HVAC becomes “oversized” due to the increased thermal efficiency of the unvented attic assembly, the HVAC system may begin to short cycle, or to quickly turn on and off, as it works to manage temperature. This short cycling of the HVAC system may have negative impacts on the comfort and efficiency of the building and possibly on the lifespan of the system. The guidance document recommends that the application contractor involve an HVAC consultant to adapt the system to the new, more efficient building envelope associated with the spray foam retrofit. By far, the majority of the complaints I respond to are a direct result of inadequate ventilation and no method or design consideration for the now semi-conditioned attic. The Spray Polyurethane Foam Alliance, SPFA Builder’s Reference Handbook, list the HVAC and Ventilation as one of their initial Design Considerations. The Initial Evaluation (Test-In) is a complete evaluation of the existing home before the installation of the SPF insulation. The Test In air leakage testing is performed using a blower door to evaluate the home’s air leakage and natural ventilation before SPF application. This is then used as a baseline for quality checks and energy savings estimates. This test for existing homes should be performed before and after SPF installation. This initial air leakage or air infiltration rate is the source of the home’s air change rate ACH with a traditionally ventilated attic. The air infiltration rate is the volumetric flow rate of outside air into a building, typically in cubic feet per minute (CFM) or liters per second (LPS). The air exchange rate, (I), is the number of interior volume air changes that occur per hour, and has units of 1/h. The air exchange rate is also known as air changes per hour (ACHs). ACH can be calculated by multiplying the building's CFM by 60, and then dividing by the building volume. (CFM x 60)/volume. The American Society of Heating, Refrigerating, and Air-Conditioning Engineers (ASHRAE) has had a residential ventilation standard since 2003, ASHRAE 62.2. The ASHRAE 62.2 minimum ventilation rate formula was set at 7.5 cfm per person plus 1 cfm per 100 square feet. The standard assumes that the number of occupants in a home equals the number of bedrooms plus one. The ASHRAE 62.2 asserted that the formula used to determine the minimum airflow rate of ventilation equipment was based on the assumption that all homes deserve an “air infiltration credit” of 2 cfm per 100 square feet. This was the assumption that the homes in and before 2003 had a good amount of air infiltration. The homes built today with or without the use of SPF insulation are much tighter and have a substantially reduced air infiltration rate. So while your home’s recommended minimum ventilation rate remained unchanged for many years, ASHRAE has recognized the tighter construction of today’s homes and 10 years after the initial ASHRAE 6.2, there are new changes to the 2013 version of ASHRAE 62.2. Under the new formula, newer tightly built homes will need to be ventilated at a much higher rate, namely 7.5 cfm per person plus 3 cfm per 100 square feet. This means that for a tightly built 2,400-square-foot home with 3 bedrooms, the minimum airflow rate of the ventilation equipment has jumped 89%, from 54 cfm to 102 cfm. Long story short, the 2013 version of ASHRAE 62.2 has eliminated the air infiltration credit on new tightly built homes. Once you apply the Spray Polyurethane Foam Insulation in your attic, your home’s air leakage or air infiltration rate will be greatly reduced. This is why the SPFA Builder’s Reference Handbook recommends the Test In and Test Out with the use of a blower door to establish your homes air leakage or air infiltration rate. The Test Out your air leakage or air infiltration rate will determine the amount of outdoor air your home will require to meet the minimum ventilation rate or the ACH of 7.5 cfm per person plus 3 cfm per 100 square feet. The Final Evaluation (Test-Out) is also a complete evaluation of the existing home after the installation of the SPF insulation. The Test Out air leakage testing is once again performed using a blower door to evaluate air leakage and natural ventilation after the spray polyurethane foam insulation application. This test is then used as the actual as-built air leak and natural ventilation rate. The blower door test will provide you with your ACH by measuring your home’s actual amount of air leakage. With this information, you will now know how much additional outdoor air the home will require to meet the minimum ventilation rate. Among other issues the Test Out as compared to the Test In is the potential need for HVAC Modifications. The SPFA Builder’s Reference Handbook states that “If application of SPF renders the home to be insufficiently ventilated, work with HVAC contractor to add mechanical ventilation or HRV/ERV. Most HVAC systems are oversized to account for excess air leakage which directly affects the energy efficiency as well as effectiveness dehumidification. The application of spray polyurethane foam insulation may actually allow for the downsize of the HVAC system for better performance. To definitively establish the needs for any home once SPF has been installed and the traditional vented attic has been changed to an unvented attic, the use of a blower door must be used to establish the home’s natural ventilation rate and the homes mechanical system requirements must be properly calculated using a Manual J for load calculation, a Manual S for equipment selection, and a Manual D for proper duct design. Without the known natural ventilation rate, you can only guess at the amount of outdoor air necessary to meet the minimum ventilation rate. That is if you have even taken the ACH into consideration and added the necessary outdoor air supply. With the known natural ventilation rate and the new R values, the homes HAVC can be correctly calculated and designed. You would think knowing the impact of changing from a vented attic to a spray polyurethane foam insulated unvented attic that most home owners are performing the Test In and Test Out procedures. In actuality, less than 10% of the homes I assess have had any form of Test In or Test Out performance evaluation. It’s rare that the issue of ventilation or the home’s HVAC system is discussed at all. Remember earlier in this article we discussed the Guidance on Best Practices for the Installation of Spray Polyurethane Foam states that the contractor and the homeowner should be aware that retrofitting an existing attic by employing an unvented attic assembly technique can result in the existing HVAC system becoming “oversized” in relation to the new demand. The guidance document also recommends that the application contractor involve an HVAC consultant to adapt the system to the new, more efficient building envelope associated with the spray foam retrofit. If a ventilation system that uses the HVAC air handler fan to provide the needed outdoor air (as is the case in many supply ventilation strategies) is used, it is imperative to ensure that the air handler fan operates often enough to provide sufficient fresh air. During periods of mild weather, or at night in the summer, the air handler fan may not be called on to run for several hours, so the house would get no outdoor air during these times. To address this, control units are now available that will ensure the house always gets the needed ventilation. If the air handler does not operate enough for sufficient ventilation, the monitors will call for the fan to operate and provide sufficient fresh air. Typically, most homes need for the fan to run for between 10 and 20 minutes each hour to meet the home’s ventilation needs. An example of this type of fan control unit is the Aprilaire 8100. The introduction of outdoor air not only affects the temperature in the house, it also impacts the humidity in the house. Here in Florida, the humidity can be a critical factor that is often overlooked. Our hot humid southern Florida outdoor air supply will require mechanical dehumidification. It’s critical to include ventilation air in the ACCA Manual J, Eighth Edition (J8) HVAC sizing calculations. 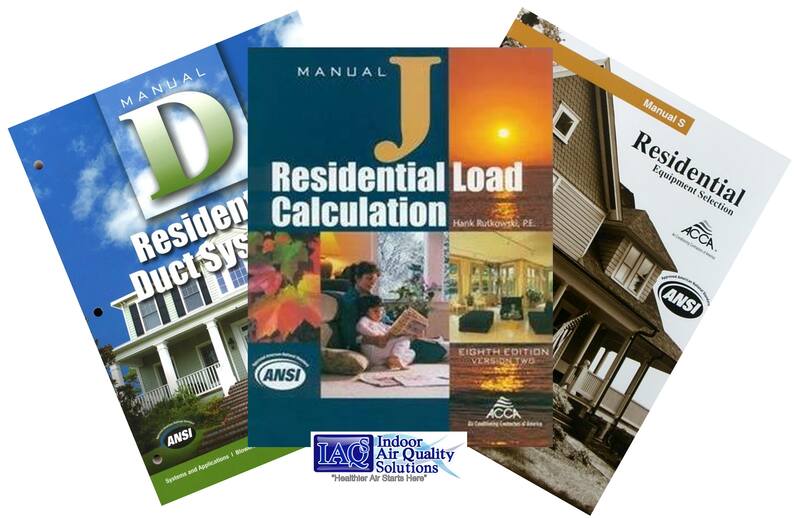 Manual J is the name for a specific protocol (often called “Heat Load Calculation” or “Cooling Load Calculation“) used to determine how much heating/cooling a home needs to stay cool and dry in the summer and warm in the winter. This load calculation process was developed by engineers in the heating and air conditioning industry and has been used for decades to accurately size heating and air-conditioning equipment. After completing this load calculation process, one can choose a properly sized piece of machinery to satisfy the load. Heating Load: This is how much heat your house will require on the almost-coldest day of the year, in the middle of the night (when there’s no help from the sun). This is the number, or load, used to select a piece of heating equipment. Sensible Cooling Load: This is the amount of sensible heat (the type you measure with a thermometer) that your system should be able to remove on the almost-warmest day of the year, during the daytime (when the sun is heating up the building). This is used, IN COMBINATION WITH the next load-type, to select the cooling equipment. Latent Cooling Load: This load describes how much moisture your system should be able to remove under “worst-case” conditions. Worst-case for latent loads are typically when it’s hot and wet outside (daytime in the summer). These three loads are used to select a piece of machinery that fits the loads (heat losses or gains) of your home. When selecting air conditioners or heat pumps, the two cooling loads should be used. And, the selected piece of machinery should be able to supply the proper amount of BOTH latent and sensible cooling, and be less that 15% over-sized, based on the Manual-J load calculation. This will ensure your system is capable of proper dehumidification (assuming the distribution system is performing properly). Proper equipment selection important and achieving occupant satisfaction is the principal goal of any HVAC design. Occupant satisfaction is maximized when the heating and cooling equipment are the correct type and size to meet the capacity requirements from the Manual J load calculation. For residential equipment selections, ACCA’s Manual S, is the only procedure recognized by the American National Standards Institute (ANSI). If the Manual J load calculation is done then the next step is to select the equipment that will deliver the necessary heating and cooling. Undersized equipment will not meet the customer’s comfort requirements at the design specifications. • Degraded humidity control in the summer. • Occupants may suffer the effects of an increased potential for mold growth. These same conditions also may contribute to asthma and other respiratory conditions. • Hot and cold spots between rooms because the thermostat is satisfied but the room is not. • Oversized equipment generally requires larger ducts, increased electrical circuit sizing and larger refrigeration tubing. These cause higher installed costs and increased operating expenses. • The equipment starts and stops more frequently, this causes excessive wear and can increase maintenance costs more service calls. In these unfavorable conditions occupants will experience discomfort and dissatisfaction. The next step is the duct design. For residential air duct designs ACCA’s Manual D is the procedure recognized by the American National Standards Institute (ANSI) and specifically required by residential building codes. Air is the first word in air conditioning. If the network of ducts carrying the air is not properly designed then the health and safety of the occupant are at risk, the equipment could fail more quickly, the energy costs could rise, and occupant comfort might be sacrificed. • The air to be too slow – the conditioned air will not circulate or mix well in the room. The design and installation of your homes HVAC system with your new spray polyurethane foam insulation SPF insulated home. The issue of home performance and ventilation must become a more critical aspect of the spray polyurethane foam insulation SPF retro-fit sales pitch. Understanding the performance changes within a home by altering the attic from traditionally vented to spray polyurethane foam insulation SPF unvented would eliminate a large portion of the SPF occupant odor complaints. You might be thinking that the new construction homes have it made right? Well, not so much. Believe it or not, many new homes are designed with no alterations to the home’s ventilation system in the area of the ventilation rate (outdoor air) and the semi-conditioned attic space. Many new homes actually have a reduction in size of the HVAC equipment as discussed earlier. There is absolutely nothing wrong with altering the home’s HVAC system to accommodate the new tighter design and improved R-value; however, there is a huge issue with the builder not taking into consideration the reduced air infiltration, ventilation rate, or air changes per hour ACH. Carbon dioxide, CO2 emissions from the new building material and the dilution of the volatile organic compounds, VOC’s due to the homes ACH. In a tightly sealed spray polyurethane foam insulation SPF home, the VOC’s accumulate in the attic. The VOC laden warm indoor air rises to the attic as the living space is cooled. Over time, this accumulation, if not properly diluted, can actually make its way down into the living space from the attic. The necessary outdoor air supply needs to properly dilute the new construction VOC’s. It’s the accumulation of these volatile organic compounds, VOC’s that is often directly associated with the SPF. Fortunately, we have well established studies of new construction homes with traditionally vented attics and no SPF insulation. These SPF free new construction VOC’s can then be compared to the samples collected from new construction homes with SPF insulation and unvented attics. If the SPF is bad, the VOC signature will be different than that of a traditional home with no SPF. It seems simple right? Well, there remain those that sample heavy and look at nothing when it comes to SPF insulation and simply point to the SPF insulation without addressing the home as a whole. When assessing the condition of any home with SPF insulation and occupant complaint, the home must be inspected as a whole. The inspection must include the design and performance of the home. For these new construction inspections there are two specific areas of concern other than the physical inspection of the installed SPF. First, is the home’s ventilation rate. We need to know what the home’s ACH is and we need to know if we are at least attaining the minimum ACH recommended by the ASHRAE 62.2. Second, is the ventilation design of the semi-conditioned attic space. How is the homes semi-conditioned attic being addressed and ventilated? These are the primary factors in a home’s ability to properly condition and maintain the indoor environment. No air circulation in the unvented attic will lead to an elevation of heat, humidity, and VOC’s. There must be a specific method of circulating air through the semi-conditioned attic space. If you don’t take ownership of this space in your ventilation design and you assume that the space will be passively semi-conditioned, be prepared to meet me on site at a future date. We’re not talking about fully conditioning the space by installing supply and return vents in the attic. You need to move air through the semi-conditioned attic. If you don’t, the attic simply isn’t semi-conditioned. It’s unconditioned unvented attic space that will soon be a source of odor and occupant complaint. So you may be asking just how we establish the new construction ventilation rate and method of semi-conditioning the attic. The Final Evaluation (Test-Out) is also a complete evaluation of the new-construction home after the installation of the SPF insulation. So at the risk of being overly redundant, ventilation cannot be stressed enough in a home with spray polyurethane foam insulation and an unvented attic. Any home with spray polyurethane foam insulation and an unvented attic must have a method of semi-conditioning the unvented attic to provide the necessary air circulation to prevent the accumulation of heat, humidity, and VOC’s. That can’t be found in expensive air sampling for VOC’s. Any home with spray polyurethane foam insulation and an unvented attic must establish the necessary minimum ventilation rate necessary to prevent occupant complaint while providing good indoor air quality. That can’t be found in expensive air sampling for VOC’s. However, both can be identified by measuring the homes performance and the use of a blower door test. And both can be improved and/or corrected once the actual performance testing has been completed. So reduce your carbon footprint and save those energy bucks. Spray polyurethane foam insulation is a great home improvement method of saving energy. Just remember one thing; if your home is ventilated the same way after the installation of spray polyurethane foam insulation you haven’t finished the home improvement process. To learn more about Mr. Lapotaire or Indoor Air Quality Solutions & Microshield Environmental Services, LLC, please visit www.FloridaIAQ.com, email info@FloridaIAQ.com or call (407) 383-9459. Since 2001, Florida residents have turned to the indoor environmental experts at Indoor Air Quality Solutions & Microshield Environmental Services, LLC. The family owned and operated companies, based in the Orlando area, offer a comprehensive approach to identifying and correcting comfort and indoor air quality problems. Their expert staff utilizes the latest technologies and industry recognized standards to identify and resolve indoor environmental issues. This week we look forward to our interview with Eugene C. Cole DrPH. Dr. Gene Cole is Director of Research for LRC Indoor Testing & Research, Cary, NC; and formerly Professor of Environmental Health Sciences at Brigham Young University, Provo, UT. He has 35 years of research experience, with a primary focus on the ecology of indoor and work environments, with special emphasis on identification and reduction of pollutant reservoirs and sources, bioaerosols, human exposure assessment and control, product evaluation, cleaning and restoration, mold and sewage remediation, and biocides. Since 2000, he has continued to conduct research on the relationship between the use of antibacterial cleaning and hygiene products in the home, and antibiotic resistance; as well as on the effectiveness of cleaning to reduce the transmission of disease agents in schools. He has also worked with national and international organizations to address environmental health and infectious disease concerns such as medical waste management in Central Europe and South East Asia, hygiene promotion in Africa, and healthy homes and buildings in the U.S. and Asia. Dr. Cole is a member of the Scientific Advisory Council of the Cleaning Industry Research Institute (CIRI), and a Fellow of the American Industrial Hygiene Association. He holds a Master of Science in Public Health Microbiology and a Doctor of Public Health in Biohazard Science and Occupational Health, both from the University of North Carolina at Chapel Hill. This week we look forward to our interview with Jim Harris, Sr., a consultant, trainer, corporate executive, and entrepreneur. Jim has had a productive and successful career in the cleaning industry for 45 years. Jim started Janitronics Facility Services in 1972 as a local cleaning service. The company has since evolved into a seven branch, comprehensive cleaning, maintenance and management service, but has a new approach: Thinking small; they specialize in creating, and sustaining a healthy indoor environment utilizing state of the art, effective ‘cleaning systems’ based on validated cleaning science research. Mr. Harris is also co-founder and chairman of the Cleaning Industry Research Institute (CIRI). CIRI is the clearinghouse for unbiased, peer-reviewed technical information and research about the science of cleaning or restoration of the indoor environment. Jim Harris has done what others have only dreamed of while building a profitable company. His company was built first and foremost on the science of cleaning. The company uses state-of-the-art equipment and processes to clean for health. To increase productivity, Janitronics developed its’ SysteamCleaning (TM) concept, utilizing state of the art workflow based on systems thinking and high performance standards. In 2000 the leadership of the company completed a succession transition to Jim Harris, Jr. and is headquartered in Albany, N.Y. They are not just dumping wastebaskets and cleaning restrooms. They pride themselves on cleaning a work environment to maintain a high health standard; focused on properly removing bio-contaminants and airborne particles. Janitronics has been successful in transforming cleaning into a science. This week we look forward to another Research to Practice presentation from one of the leading IAQ researchers in the world Rachel Adams, PhD. Dr. Adams is a microbiologist with a deep curiosity for how microbes work and how microbial interactions shape the environment around them, including our homes and our health. She is a Microbiologist with the California Department of Public Health and a Project Scientist at the University of California, Berkeley, in the Department of Plant & Microbial Biology. Dr. Adams has expertise in using sequence-based technology to study microbial exposures in indoor environments, has developed methods to improve the identification of microbes, and has interest in understanding the consequences of indoor microbial exposures on human health. Dr. Adams holds a B.S. from Georgetown University and a Ph.D. from Stanford University and is a member of the Mycological Society of America and the International Society of Indoor Air Quality and Climate (ISIAQ). This week we Flashback to one of our more popular shows with Christine Oliver, MD. Dr. Oliver joined us to discuss Odors and Chemical Sensitivities about 2 years ago. This was prior to our first YouTube videos so we are going to add some graphics and photos this week. Dr. Oliver is President of Occupational Health Initiatives, Inc. in Brookline, MA. She is an Associate Physician in the Department of Medicine (Pulmonary and Critical Care Division) at the Massachusetts General Hospital (MGH) and Associate Clinical Professor of Medicine at Harvard Medical School in Boston. Board certified in occupational medicine and in internal medicine. Dr. Oliver’s primary specialty is Occupational and Environmental Medicine, with an emphasis on occupational and environmental lung disease. At the MGH she evaluates and cares for patients with occupational and environmental illness and disease, including occupational asthma, interstitial lung disease, building-related health problems, and chemical sensitivities. Dr. Oliver has done research and published in the area of occupational lung disease and she has testified before the United States Congress with regard to work-related health issues and risks. For the past three decades an important focus of Dr. Oliver’s consulting work has been indoor air quality and related health effects. She has lectured and published on this subject and she has been actively involved in indoor air quality assessments in a variety of settings. These include health care facilities, courthouses and other government buildings, schools, and commercial office buildings. Together with industrial hygienists, engineers, and human systems specialists she has worked to identify, characterize, and resolve air quality problems and their related health effects. In 2009 she was a participant and presenter in the ASTM Johnson Conference on the standardization of mold response procedures. An important component of Dr. Oliver’s clinical work has been in the area of fragrances and their related health effects, including causation and/or exacerbation of chemical sensitivities. She has lectured on these topics, counseled patients and their families with regard to steps that can be taken to identify and remove fragranced products from their environment, and advocated for a fragrance-free policy in the clinic in which she works. Radio Joe is on the road this week. On Iaqradio+ we will Flashback to Part 2 of our original series with Ritchie Shoemaker, MD. We will review key points from week one and get into more detail about Dr. Shoemakers research on sick building syndrome and water damaged buildings plus information on treatment options for patients and answers to questions sent in by our listeners. This week we welcome Parham Azimi, PhD to Iaqradio+. Dr Azimi is a research associate in the Department of Civil, Architectural and Environmental Engineering at Illinois Institute of Technology. Much of his research work has focused on fate, transport, and control of indoor aerosols of indoor and ambient origin, chronic health impacts of fine particles in various microenvironments, and energy performance of residential and commercial buildings. Parham is a member of ASHRAE Technical Committee 2.4, UL 2904 Standard Technical Panel, International Society for Indoor Air Quality and Climate (ISIAQ) and American Association for Aerosol Research (AAAR). Dr. Azimi’s work came to our attention recently when we were sent a copy of a recent paper he worked on with Brent Stephens, PhD called “A framework for estimating the US mortality burden of fine particulate matter exposure attributable to indoor and outdoor microenvironments”. Dr. Stephens joined us on March 13, 2015 for a great show on The Intersection of Building Science, Energy Efficiency & IAQ. Dr. Ritchie Shoemaker first joined Iaqradio as a guest back in April of 2008. Since then we have welcomed him back once a year or so to update us on his research into Chronic Inflammatory Response Syndrome (CIRS). Today we are going to replay our first show with Dr. Shoemaker and we hope to have him join us again soon for another update. Following his bio we have listed all our shows with him over the years. Ritchie Shoemaker, M. D., is a recognized leader in patient care, research and education pioneer in the field of biotoxin related illness. While illness acquired following exposure to the interior environment of water-damaged buildings (WDB) comprises the bulk of Shoemaker’s daily practice, other illnesses caused by exposure to biologically produced toxins are quite similar in their “final common pathway.” What this means is that while the illness might begin acutely with exposure to fungi, spirochetes, apicomplexans, dinoflagellates and cyanobacteria, for example, in its chronic form, each of these illnesses has similar symptoms, lab findings, and Visual Contrast Sensitivity findings. Taken together the inflammatory illness from each of these diverse sources is known as a Chronic Inflammatory Response Syndrome. We do not have a blog for Dr. Shoemakers first few shows. He joined us before Cliff started doing a weekly blog. It may take a few time listening to make sense of everything he is proposing. It was very helpful when he sent me the Bio-toxin Pathway chart to follow. Print this out and have it handy while listening to his shows and it will help you immensely. EPISODE 535: Oliver Threlfall - CEO Steamatic of Australia - A Unique Perspective on how the Global Restoration Big Dogs Play! Over the past 30 years Oliver Threlfall has been totally dedicated to the cleaning and restoration industry. He studied biology at Deakin University- before commencing Steamatic in Melbourne, Victoria in 1986. He then completed IICRC (The Institute of Inspection, Cleaning and Restoration Certification) training in various modules and in addition took Microbial and Bioaerosol remediation training under the guidance of Dr. Tullis and Dr. Thulman of Duke University. Steamatic was formed in Australia in 1986 following requests from underwriters to establish proven claims reduction services that had been demonstrated overseas. They then transformed an established cleaning company into a specialist cleaning technologies firm. Oliver is the Steamatic of Australia CEO which makes him a very busy and connected man "down under". EPISODE 534: Corbett Lunsford - The Home Performance Worskshop & The Worlds Highest Performance Tiny House on Wheels! Corbett Lunsford, wasn't a home performance expert- he used to play piano for ballerinas. In 2008, he learned a few things very quickly: construction is unbelievably messy, most pros are over-rushed and under-paid, and homeowners end up suffering in small ways, for their entire lives in a house. None of this has to be so- we can opt out of the whole thing with performance testing. His goal is to package building performance so it can easily be understood and used by professionals and consumers alike, for better buildings worldwide. In 2009, he started teaching pros through the Building Performance Workshop and he has hosted over 300 YouTube videos and 80 interviews for the Building Performance Podcast. He also wrote the book Home Performance Diagnostics: the Guide to Advanced Testing, and developed the APT Reports software tool. In 2016 he and his wife Grace built the world's highest performance tiny house on wheels, the #TinyLab, and toured the US before settling down in Atlanta, Georgia. Along the way, they created the first TV series about home performance, Home Diagnosis, which airs on public TV across the U.S. Corbett, Grace, and their new baby went on a 13,000 mile, 34-city U.S. Tour from April 2016-January 2017 in the world's highest performance tiny house on wheels, the #TinyLab. Their mission was simple: to revolutionize the home market by teaching consumers and contractors alike to use scientific testing to prove the work gets done to quality standards. Each city on the Proof Is Possible Tour was sponsored by a local company that shared the passion for empowering homeowners and changing the game. Along the way certain cities shared in filming of the couple's TV show Home Diagnosis. They invited over 7,000 strangers into their home on the tour, and now live in Atlanta, Georgia. Today we are going to try something new and if it works we will make it a regular part of the line up. We are going to throw out some topics, invite a few friends and have a discussion about IAQ, disaster restoration and building science. We also encourage listeners to text in your questions or comments. Today we expect to hear from Jay Stake, Eric Shapiro, Carl Grimes, John Downey and Pete Consigli. The topics we will throw out for discussion will come from the list in this week’s show title. We have some of the leaders of the industry join us every week so lets take advantage of that and start a conversation.